As I have discussed in previous recipes, such as my “Rye Wit” and “100% Rye Pale Ale,” we can take advantage of the gloppiness of rye wort to create tasty low gravity beers that maintain substantial mouthfeel. Too much rye can give you a beer with the consistency of Vick’s Formula 44D, but if you pull back on the reins (notice my restraint in not adding a “Patsy” reference here) and add half as much, you get a more “normal” tasting beer with half the alcohol. 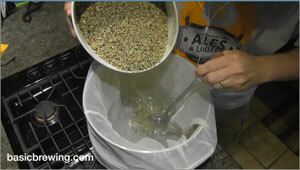 Combine with 3 gallons (11.4 liters) water to mash at 152˚F (67˚C) using Brew in a Bag for 60 minutes. 14 g East Kent Goldings pellets – 60 min. 14 g East Kent Goldings pellets – 10 min. See the Basic Brewing Video episode below for more detailed instructions and tasting notes from Steve Wilkes and me. Notice the almost equal amount of base malt to specialty malts in the recipe. One would expect such a beer to be cloying and too sweet. However, this beer isn’t syrupy. It presents itself as something more substantial than it is, alcohol-wise. Some of the experienced beer tasters I shared this beer with in blind tastings said the beer tasted as if it had as much as 6.8% alcohol. Some described it as being like a Robust Porter. The beer is rich and flavorful while having a clean finish. I consider it to be a success. My next target was inspired by an ESB that Steve Wilkes brewed to be featured on Basic Brewing Video. I wanted low gravity while bringing the characteristics of Maris Otter to the party. Combine with 3 gallons (11.4 liters) water to mash at 151˚F (66˚C) using Brew in a Bag for 60 minutes. 16 g East Kent Goldings pellets – 60 min. Both beers are very interesting, flavorful and drinkable. The Porter is more faithful to the original style that inspired it, but the “ESB” provides a new take on English-inspired ales. Next stop on the rye quest: a hoppy sour 100% rye beer. Stay tuned . . . I was very dubious about the rye porter recipe, but had a go at it anyway (http://www.forum.craftbrewing.org.uk/viewtopic.php?f=63&t=10630#p140632 – different yeast, slightly more complex mash bill due to substitutions). All in all it was a very nice beer and a good recipe. I just made this and was quite surprised it came out as good as it has. I did a little bit of substitution also – decreased the black patent a little and increased the chocolate malt due to my own tastes on brewing James’ porter recipe in the past. Mine was 2.86% but has fooled everyone who’s tried it so far – very satisfying. I have brewed a couple batches of your Rye Wit with Saison yeast and it was a huge success (thanks for that), so I am definitely going to have a go at your Rye Porter. One question: what was the estimated IBU for this recipe? When I put it in BeerSmith it says over 40. Is that right?